Service Center (“help desk”) operations to the 4545 ERC. I didn’t think too much of it at the time. We’re located across the hallway from the service center, and they’ve had problems with localized leaks before that have disrupted their operations. After hopping on the bus and silently entertain myself by watching people get their umbrellas blown inside out, I amble through the rain and into the tower. Making up to our floor, I see that the problem was just a tad larger than I expected. There were large pools of water of water spanning across the aforementioned hallway, and there were ladders, fans, pumps, and maintenance workers everywhere. You know that scene from Office Space at the end, where the building is on fire and everyone is outside watching it? I was distinctly reminded of that. Except with water instead of fire. Poor photo of the corner of the water source. I wonder in and check on my plethora of equipment. 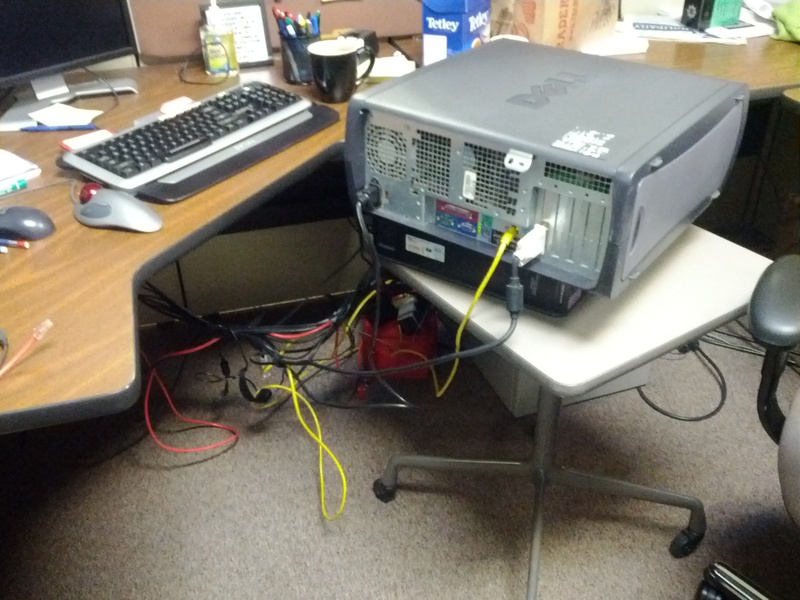 It seems someone stacked my footrest/server on top of my desktop, and both were placed on a side table. My switch was suspended in mid-air, and cables were all over the place. Yet somehow they were still powered and networked. Hunh. We were out of the office for two days for cleanup and recovery operations. 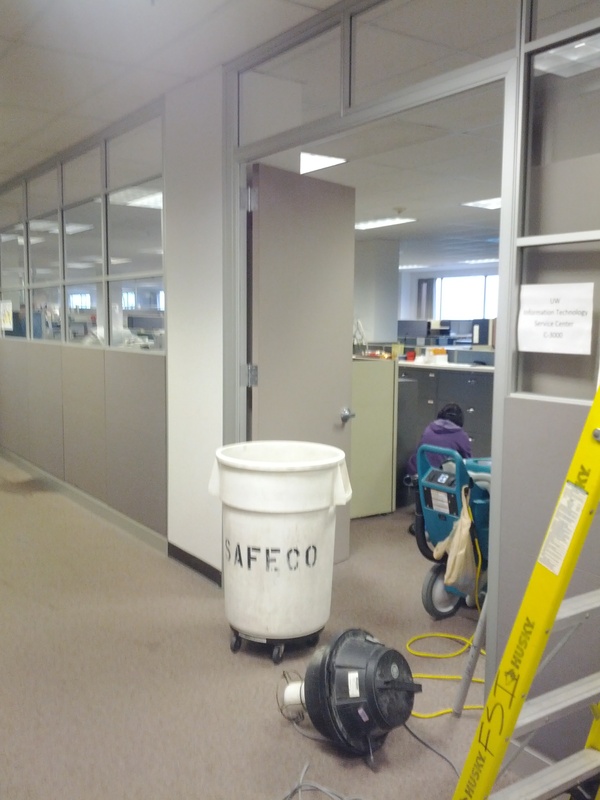 The office area across the hallway, where the flood started, sported about 4 inches of water at one point in time. It seems a radiator burst at around 7:00am and it took about 2.5 hours to safely shut off the heating system and stop the leak: otherwise the entire pressurized system would have burst. My systems weren’t impacted, and minimal water actually entered my castle of awesome.